Celebrated merchant John Wanamaker is credited with the phrase “Half the money I spend on advertising is wasted; the trouble is I don’t know which half.” The traditional model of marketing was to speculate on a particular media and hope that some it would reach the right demographic. Some adverts worked, others fell on stoney ground. To achieve this they considered & analysed the various forms of marketing and focused on the best and arguably most effective form of advertising, word of mouth. They set up an Ambassador Scheme as a way to thank and reward people who recommend them. Originally this started on a casual basis with their existing clients who were passing their details to fellow businesses. As it grew to friends & family it made sense to open this up to the good people of the Wirral and thus the scheme was born. 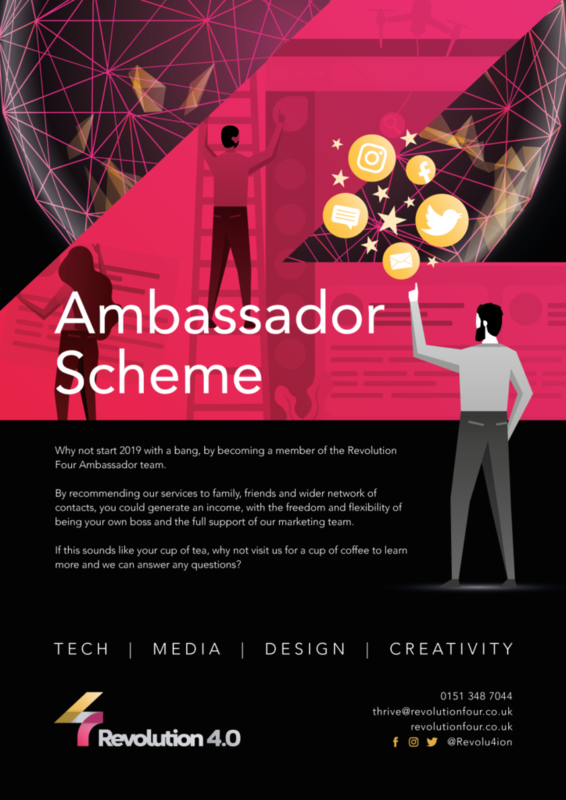 New for 2019 is their Accreditation programme for the Ambassador Scheme. This allows someone to supplement their income on a different level, effectively becoming a freelance member of Revolution Four squad. The Accredited Ambassador Scheme has now launched so the team are looking to onboard new members this year. There is no set amount of time that’s required making this ideal for people who have a bit of spare time on their hands. Nik said “It’s a great compromise of having all the benefits of being your own boss whilst still having the support, offices & power of a professional company”. If this sounds interesting, Nik & Justine are happy to have a (no obligation) chat over a coffee or glass of wine.